Meet the new members of the Matilda The Musical West End cast, beginning performances from 11 September 2018. Isobel Hubble and Francesca McKeown will join Sara Munday and Olivia Wells in the title role as Matilda. Hayden Tee will toe the line as Miss Trunchbull, whilst Rob Compton and Holly Dale Spencer will join the company as Mr and Mrs Wormwood. Gina Beck continues to play Miss Honey for a second year. 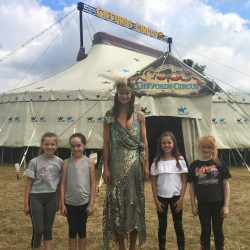 Watch as our four Matildas learn acrobatics, clowning and juggling with Giffords Circus. The full adult cast includes Alex Louize Bird, Gina Beck, Rob Compton, Holly Dale Spencer, Jaye Elster, Glen Facey, Alex Hammond, Peter Houston, Jessica Joslin, Bethany Kate, Sammy Kelly, Ben Kerr, Bryan Mottram, Malinda Parris, James Revell, Gemma Scholes, Simon Shorten, Hayden Tee, Callum Train and Robert Tregoning. The other young performers announced today join the London company in the three teams who play the roles of Bruce, Lavender, Amanda and the rest of the pupils at Crunchem Hall and are as follows: Lois Abercrombie, Tom Brown, Emilia Bosi, Toby Brandon, Quincy Miller-Cole, Lottie Cook, Imogen Darwen, Jimmy Fordham Reed, Clara Freeman Alves, Stella Haden, Jobe Hart, Noah Leggott, Archie Lewis, Henry Littell, Austen Phelan, Marley Quinlan-Gardner, Daisy Statham, Cherry Vaughn-White and Rochelle Wyatt. Jacob Bland, Mia Byers, Sadie Victoria Lim, Asher Ezequiel, Darmani Eboji and Sam Winser will continue in the roles of Bruce, Lavender, Amanda and the pupils at Crunchem Hall.